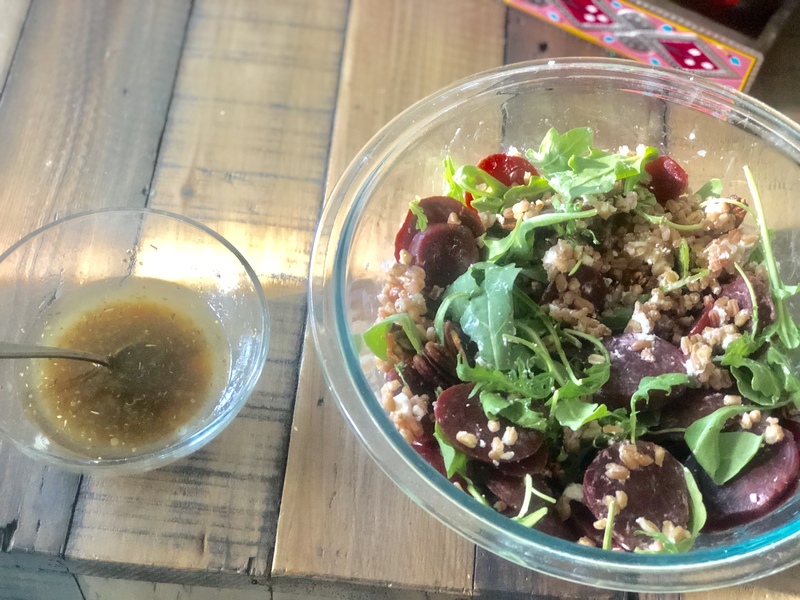 This beets, arugula and farro salad is the BOMB! It’s super delicious, easy to put together and very nutritious! Here is how to make it! For dressing: Extra virgin olive oil, lemon, salt, pepper, organic apple cider, oregano leaves, soya sauce. Boil/steam the beets and then cut in cubes (you can also buy the pre-prepared ones from the super market). Boil the farro with some water till it softens (in around ten minutes) and all the water boils down with it. Strain out the water. Roast the pecans on a sauce pan without any oil. In a bowl mix the beet cubes with the farro and argula leaves. Add crumbles of goat cheese on top along with the roasted pecans. Prepare the dressing by mixing extra virgin oil with some lemon zest, salt, pepper, one tablespoon of apple cider vinegar, a few oregano leaves and soya sauce. Take out portions of the salad in bowls, spread the dressing and toss the salad together. This beets, arugula and farro salad is packed with nutrition. Farro is a heart healthy choice being really low in fat and with no cholesterol! Farro is a great source of iron and high in fiber. It has a nice chewy taste and we love that in our salads. Jaffar and I have been trying to eat more vegetables and therefore I’m on a mission to discover and make delicious salads. Will keep sharing them here! Till then do let me know if you try this beets, arugula and farro salad. Previous Post HelloFresh Review: Convenient, Delicious and Healthy Meals!